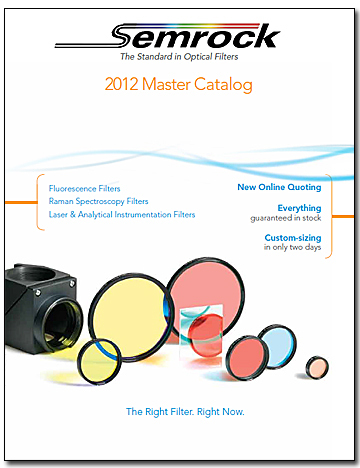 Rochester, NY, Semrock, Inc. announced the release of its new 108-page, full-color, 2012 Master Catalog of optical filters and related products. This comprehensive catalog contains fresh Technical and Product Notes along with larger than usual selection of new products introduced in the past six months. Over seventy new thin-film filters for fluorescence microscopy and measurements, Raman spectroscopy, and other laser analytical instrumentation applications, as well as many improved versions of existing optical filters and sets are available. Among the standouts of this print edition are eight new VersaChrome® Extended Overlap tunable bandpass filters, with between 4-12 nm of additional wavelength overlap to allow for system variation such as AOI accuracy and cone half angles. They offer OD 6 blocking over the full tuning range for the most sensitive of instruments. The Extended Overlap filters offer the same angular tuning range of 0 – 60° as the other tunable filters and are ideal for applications from fluorescence imaging and measurements to hyperspectral imaging and high-throughput spectroscopy. Mirrors are an important new addition with something for every need. The ATFilms ultra-high reflectivity mirrors are now available through the catalog. Manufactured for five laser lines, the HRM series mirrors have reflectivities ranging from 99.97% to 99.999% depending on wavelength and can be used for cavities with finesses of more than 300,000. Two new Semrock general purpose mirrors offer the ability to have hard-coated mirrors in a thinner-than-standard thickness for a variety of fluorescence applications. These mirrors can be used in microscopes or by researchers looking to do beam steering. With high reflectivity over the visible or NIR region (350-700 nm and 650-1300 nm), and thinner 25.2 mm x 35.6 mm x 1.05 mm size, these mirrors allow the flexibility needed in a laboratory or research setting. For multimodal applications, Semrock’s new FF01-890/SP-25 laser short wave pass emitter with blocking at OD 6 from 890-1400 nm and the FF875-Di01-25x36 long wave pass dichroic beamsplitter are new to the catalog The dichroic reflection band is so wide, it appears to be a mirror when viewed at 45°. Also worth noting are the five new laser Pinkel sets and the sedat laser filter set, LF488/543/594/3X3M-A, keyed to popular laser wavelengths as well as the new bright-field set, to maintain –ZERO pixel shift performance when your microscope is in bright-field mode. Request your free copy of the catalog directly from the website, either in print or as a downloadable PDF.